This is…… well this is weird. 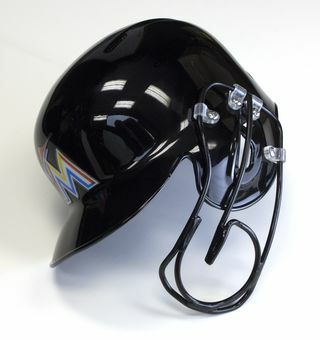 You know Giancarlo collaborated with the manufacturer Schutt Sports to be as stylish as possible on this – the first thing I noticed was the scripted ‘G’ in the middle of the mask – but it’s still just a strange looking thing to see worn on a baseball batting helmet. But this is the new look of baseball’s most feared slugger. For some reason, we’re kind of hoping he gains his comfort back in the box enough to drop it at some point. Michael Jordan just wouldn’t have looked right sporting a Rip Hamilton mask his entire career. As hard as Stanton may try to make this thing a thing, we hope it doesn’t stick. Safety first, and all but still.